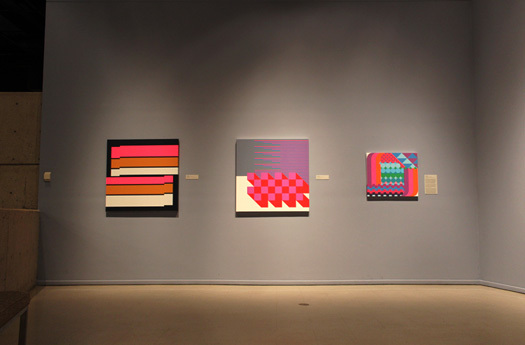 Tonight’s the opening reception for Arizona Biennial 2007, at Tucson Museum of Art. 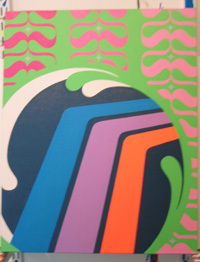 I’ll be showing FF0000uturo, a modern abstract art work there . . . can’t wait to check it out! 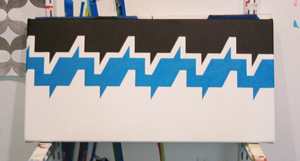 Aside from Arizona Biennial 2007, here’s a photo of a painting that I started last night. Still have some cleaning up to do, and I’m wondering whether it needs something more. I have a few ideas, but I also think I should leave it alone. When I get back, I might make another one, adding those ideas. Ultimately, just messing around. Also, here’s an update on the painting I finished a couple of weeks ago. I think I was calling it Corporate Wellness Program. Basically, I added lightened up the magenta stripe motif; wanted it to have a bit more spark. Dark magenta for one stripe is fine, but for all three stripes was lacking. At right is the before image; at left, the after — the final result. I’ll update you on Arizona Biennial 2007 at my first opportunity. 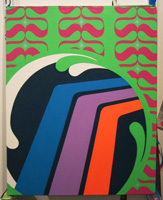 I am pleased to announce that my painting FF0000uturo, shown here, has been selected for the 2007 Arizona Biennial. 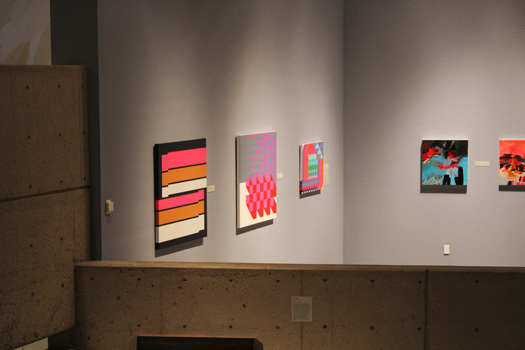 The exhibition will be hosted, as always, by the Tucson Museum of Art. The 2007 Arizona Biennial will run from May 19 through August 19. 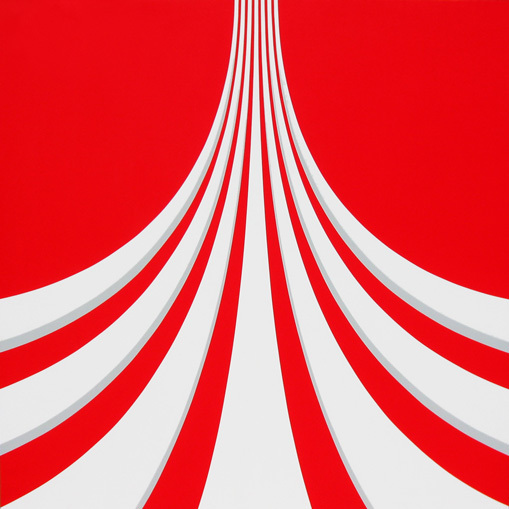 The guest curator is Ms. Dianne Vanderlip, curator of modern and contemporary art at the Denver Art Museum. My painting’s appearance marks the third straight time in which I will exhibit in an Arizona Biennial, a fact of which I’m very proud. In 2003, To Rinse Away the Tiny Particles was selected by guest curator Toby Kamps, now director of the Institute for Contemporary Art in Portland, Maine. In 2005, Synthetic Landscape was chosen by Siri Engberg, curator at the Walker Art Center in Minneapolis. So, my friends, I hope you can make it to the Tucson Museum of Art this summer to check out the show. The biennial is always an interesting cross-section of what’s going on, in terms of the arts, in this strange and sublime state I call home.